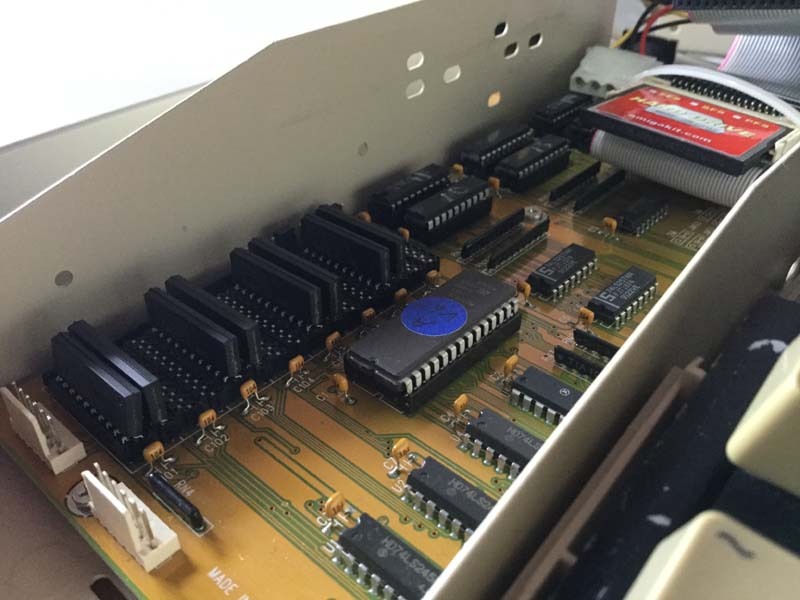 This is a follow up to my efforts on installing a Compact Flash drive in an Amiga A500+. My initial aim was to replace the Alfapower hard drive enclosure which would reduce the overall footprint of the system and do away with the constant whine of the hard drive. At this point I was able to get the Amiga to boot from the Flash drive while attached to the IDE port on the Viper Accelerator. 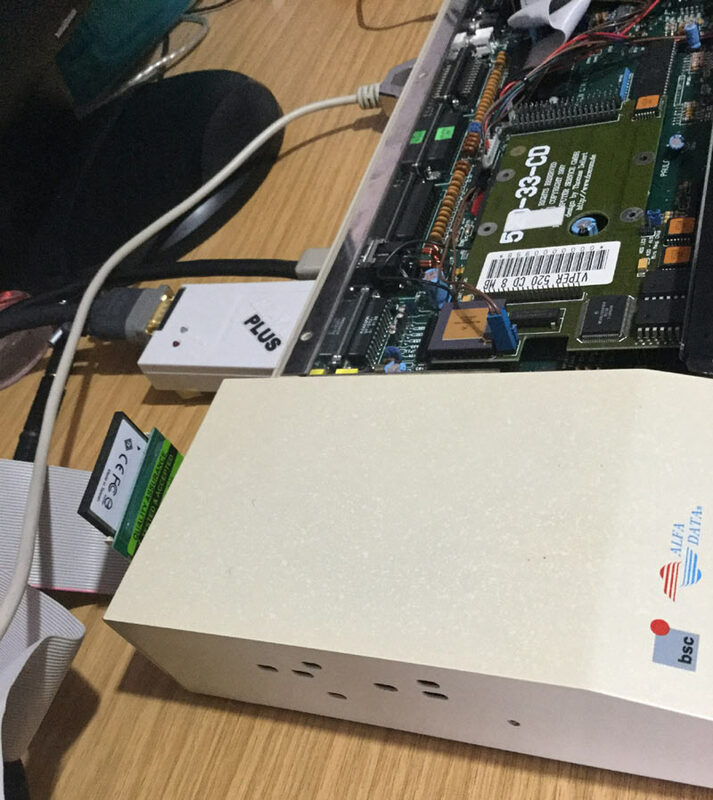 My attention then turned to the CD Drive connected to the Alfapower via an IDE cable with a power cable connected to the serial port on the back of the A500+. After some experimenting I found that the IDE CD drive was not recognised when connected to the accelerator board. I also found that it was not recognised when I removed the hard drive from the Alfapower and reconfigured the CD drive as the IDE master. The driver install software just couldn’t see it. I did have success though when I moved the Compact Flash drive from the accelerator board to the Alfapower IDE connector. In the image above I have removed the old hard drive and installed the CF adaptor. You can see that the hard drive enclosure also contains 4mb of Zip ram chips. The move raised another issue. At this point the only CF card I had was a 4gb card and all that space was being used by the 3 partitions. Only the boot partition was recognised as usable, the other two classed as NDOS. This isn’t the case when it’s plugged into the IDE port on the accelerator. A quick look online suggested that the IDE interface may not read past a set limit and any partition that crosses or is beyond that limit cannot be read. I decided to purchase another CF card to experiment with. This would mean that the bootable CF card was preserved. I attempted to get WinUAE to read the new card so that I could create smaller partitions. This didn’t work and after some online searching I concluded that I needed an ADF image of the Workbench Install disk. I purchased yet another CF card, this one came with Workbench preinstalled. The biggest help was that it also came with the Workbench 3.1 discs in ADF format. Stroke of luck. WinUAE could read this new card straight away and I copied the Workbench ADFs to a PC folder that WinUAE was using as a drive. This was great as I now had a bootable Workbench Install disc with HDToolbox. At this point I found a possible reason why HDToolbox couldn’t find my previously assumed incompatible CF card. WinUAE uses a SCSI device name of uaehf.device instead of scsi.device and so this needs to be changed in the HDToolbox configuration. Back to WinUAE which I configured to boot from the Workbench Install ADF image.The CF drive was mounted as a Hard Drive. Once booted, I copied the HDToolbox program to the Ram Disk to and edited the icon configuration. This did the trick and the drive could be seen. I was able to create partitions but another obstacle was encountered when I went to save the changes. Seems WinUAE couldn’t write to the drive while it was still mounted on the PC. I tried a couple of things but in the end I had to use Diskpart to clean the CF card, this appears to remove the filesystem from the drive. I rebooted WinUAE and relaunched HDToolbox and this time the partitions were created. The following is my guide which should turn any CF card into a usable, bootable drive that can be used on real Amiga hardware. CF Card & some form of reader for your PC. You should only need to do this is your CF card has been formatted by something other than Workbench. Connect the CF card to the PC. Click on the Windows icon (bottom left of the desktop) and then on All Programs. Click on the Accessories folder and then right click on Command Prompt. Select Run as Administrator. In the Command Prompt window that opens up type “diskpart” and press return. You will see that the usual C:\ prompt has now changed to DISKPART>. Now type “list disk”. You will be presented with a list of all the drives on your system. Locate the CF drive in the list. You should know the size of the CF card which will help you. You are looking for the disk number that is listed against your CF drive. If you are unsure stop here as you could wipe the wrong drive. Now type “select disk #” and replace the # with the drive number for your CF drive. Again make sure it is the correct one. Now type “clean”. All formatting info will be wiped from that drive. You can close the Command Prompt window at this point. Go to your install of WinUAE and right click the icon and select Run as Administrator. If you have a configuration already set up you can load that into WinUAE and remove all of its floppy drives and hard drives. 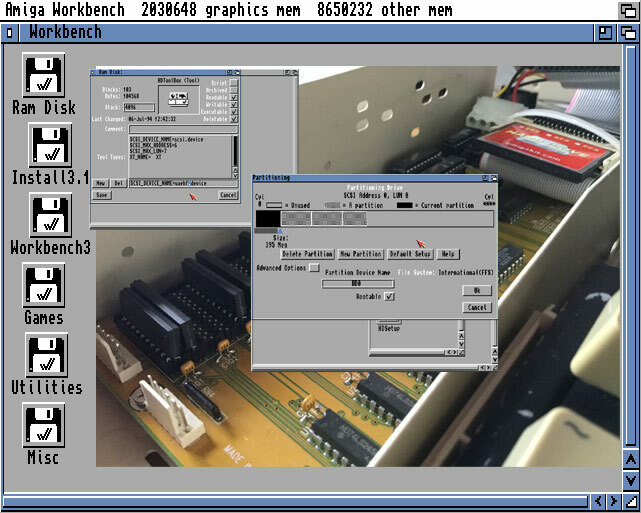 Or you can set up a new one from scratch by selecting your Amiga type and ROM to match the version of Workbench you will be using. Go to the Floppy drives section and add your Workbench Install ADF image to DF0. Go to the CD & Hard Drives section and click on Add Hard Drive. Make sure the CF card is connected to your reader and select the Hard Drive drop down menu and select your CF card. Ensure that Read/write is ticked. You will notice that the device type is UAE (uaehf.device). Now click on Add hard drive. You might want to save this WinUAE configuration so you don’t have to set it up again later. Now click on Start and wait for the Workbench Install disk to boot up. Double click the Ram Disk icon. Double click on the Install disk icon and then double click on HDTools. This will open another window and one of the icons there will be HDToolBox. If we run HDToolBox from here it will not be able to find your CF drive, we need to change its configuration. Copy HDToolBox to the Ram Disk by dragging it. Click on the copy of HDToolBox on the Ram Disk and head to the Icons menu at the top of the screen and then select Information. This should open up a window with the configuration. Click on SCSI_DEVICE_NAME=scsi.device and and change it to SCSI_DEVICE_NAME=uaehf.device and then click Save. Now double click the HDToolBox icon in Ram to run the program. Once loaded you should see your CF drive listed with a SCSI Interface and its Status is most likely listed as Unknown. Its worth mentioning that you should never use the Low Level Format option presented on this menu. Click on Change Drive Type to be taken to the Set Drive Type window. You should now see a window showing info on Cylinders and Heads etc. We don’t need to set anything here. We can let it do the work by clicking on Read Configuration and then on Continue on the small pop up that appears. You will see that the drive info has changed. Just click OK to return to the Select a Drive Type window. Click OK again. You should now be back at main menu and the drive info has been updated. From here select Partition Drive. This is where you can create and size your partitions. Use the slider to create your first partition, as you move the slider and release it you will see the size in megabytes. Once the size is set you need to give the drive a Device Name. Usual names are DH0 or HD0. Type your name and press Enter (this is important). You also need to make sure that Bootable is ticked for this partition as Workbench will live here. If you want to create a 2nd partition click on New Partition and again move the slider to size it. Give it a Device Name such as DH1 or HD1 and press Enter to set the partition. This disk should not be bootable. You can go on to create further partitions if you wish. Be aware that some IDE interfaces may not access over a set size so you may wish to ensure that your all partitions do not exceed 1 or 2gb in size when added together. This may not be the case with A600 and A1200 internal interfaces but my A500’s Alfapower interface doesn’t seem to like more than 1Gb. Back at the main menu select Save Changes to Drive. This should take a second or so and once complete the Save Changes to Drive button should be ghosted out to prevent you clicking it again. Now press F12 to bring up the WinUAE properties window and click on CD & Hard Drives to see your CF drive listed. Ensure the CF drive is highlighted and click the Remove button. Now go to the Windows USB Eject icon and eject the CF drive from Windows as you would do for any USB drive. Remove the CF card from the reader and then plug it back in. Windows will not know what to do with the drive and prompt you to format the card. Do not, just close the window. Now go back into the WinUAE properties window and click on Add Hard Drive and add your CF drive back to the Amiga system. Once that is done click on Reset to reboot your emulated Amiga. The ADF image will boot again and you should see your new CF partitions listed as NDOS disks. Single click on the drive you made bootable and select Format from the Icons menu. Give this a New Volume Name of Workbench. Untick Trashcan and click Quick Format. Repeat this for the other NDOS discs, giving each disk its own name. Your CF drive is now ready to be used in your real Amiga. 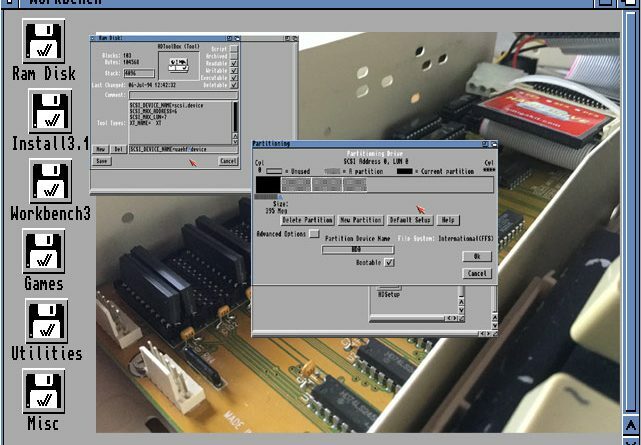 You’ll need to install Workbench on it which you could do using disks on your Amiga or using ADF images on WinUAE if you have them. I didn’t manage to reduce the footprint of the system as I still need to have the Alfapower enclosure attached. I could move the CF card back to the internal IDE port on the accelerator card but that would mean losing the CD drive. It has been a bit of a struggle to get to this point. I now have my old, 4 partition, 320mb system hard drive copied over to a CF card with 4 partitions that add up to just under 1Gb. On my 2nd attempt at creating 4 partitions that all fit within the IDE interface space limit I noticed something odd. After having previously loaded the CF drive with files and then having to re-partition I found that the Quick Format left a few files and folders behind from the previous set up. A full format from the Workbench disk fixed that. I decided to use the short IDE cable on the CF adaptor and have the CF drive poke out of the rear of the hard drive enclosure. It’s not very neat but it will allow me to easily swap CF cards…..maybe I will set up a dedicated gaming card.